Bolingbroke publicly accuses Mowbray of treason; Mowbray denies the charges. King Richard orders them to fight a duel. The Duchess reveals that her husband was murdered on Richard’s orders. Gaunt is too loyal to the crown to take action. Richard banishes Mowbray for life and Bolingbroke for six years. Gaunt tries to comfort his son. Richards hears that Gaunt is on his deathbed and plans to fund his war in Ireland with Gaunt’s money. After Gaunt dies, Richard disinherits Bolingbroke. He then goes to Ireland, leaving York in charge. The Queen hears that Bolingbroke is in England with an army. York musters troops; Bushy and Green flee to Bristol. Bolingbroke promises that he has only come back to England for his inheritance. Outnumbered, York surrenders. Believing that the king is dead—and frightened by disturbing omens—Richard's Welsh army disperses. Bolingbroke captures Bristol Castle and executes Bushy and Green. Richard learns that the Welsh army is gone, York has surrendered, and all of England is in revolt against him. Bolingbroke arrives at Flint Castle; Richard surrenders and becomes his prisoner. The Queen overhears a gardener telling a servant that Richard is a prisoner and Bolingbroke will soon be king. Richard gives the crown to Bolingbroke and is sent to the Tower. Aumerle and Carlisle plot to restore him to the throne. The Queen meets Richard outside the Tower before she is exiled to France and he is sent to Pomfret Castle. Aumerle reveals his plot to assassinate Bolingbroke. York, Duchess, and Aumerle rush to court to explain themselves. Aumerle arrives to confess the assassination plot; Bolingbroke forgives him at the Duchess's request. Exton thinks that Bolingbroke has asked him to kill Richard, so he sets out for Pomfret. Richard sits alone in his dungeon and is visited by his old groom; Exton attacks and kills him. Exton shows Richard’s body in a coffin; Bolingbroke is horrified and plans a pilgrimage to atone for the murder. Houghton, Eve. "Richard II Translation." LitCharts. LitCharts LLC, 19 May 2017. Web. 21 Apr 2019. Houghton, Eve. 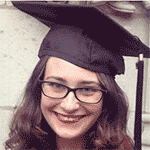 "Richard II Translation." LitCharts LLC, May 19, 2017. 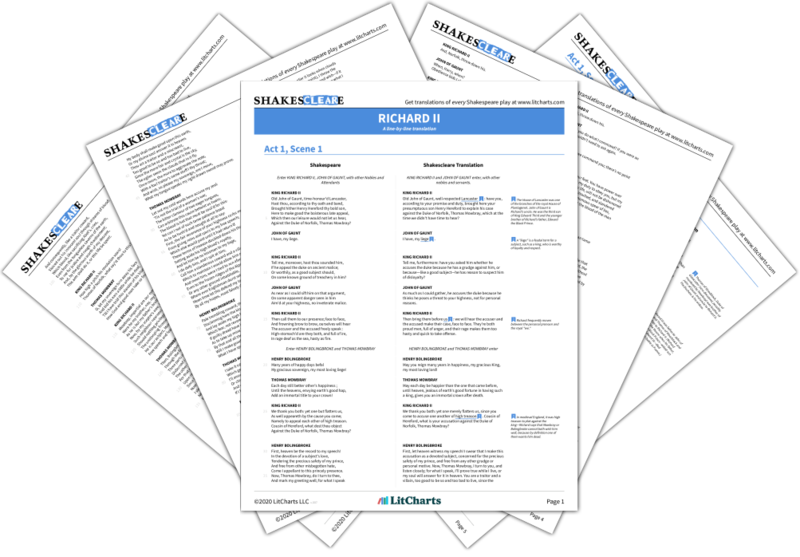 Retrieved April 21, 2019. https://www.litcharts.com/shakescleare/shakespeare-translations/richard-ii.